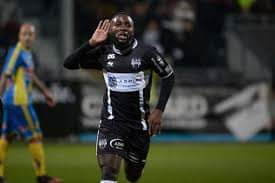 Nigerians Anthony Bassey and Henry Onyekuru were both on the scoresheet in the Jupiler League on Saturday as bottom side Westerlo thrice came from behind to earn a point at Eupen in a 6-goal thriller. It took the hosts only two minutes to get in front. Mamadou Sylla shrugged off two defenders to set up Jean Amani, who slotted beyond Koen van Langendonck from close range. The visitors responded nine minutes later through Silvere Ganvoula. The defender rose above his marker to head Trinidad and Tobago midfielder Khaleem Hyland’s looping cross into the far post. The ball went in via the upright. On 20 minutes, Anthony Bassey restored Eupen’s advantage. The Nigerian scored a screamer after receiving a shot pass near the centre circle. Yoni Buyens equalized seconds after the half-hour mark, when the ball came back off the post following a free-kick. Two minutes after half-time, Eupen were back in the lead- this time through Bassey’s compatriot, Onyekuru. The goal- which saw the forward finish off a delightful one-two move that also involved Mamodou Sylla- was the striker’s seventh in the league this season. Belgian forward Benjamin De Ceulaer’s 54 minute half volley, though, ensured a share of the spoils.